Our friends over at Mr. Handyman love nothing better than to sink their power tools into a few pumpkins. 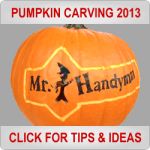 This year Mr. Handyman has some great ideas on pumpkin carving and decorating that are safe for kids of all ages. If you are looking for new designs, they have 12 new free, printable pumpkin carving templates that let you create the perfect jack-o-lantern by mixing and matching eyes, noses and mouths. Kids love the chance to show off their creativity, but saws and knives are just not safe for younger children. Covering a pumpkin with chalkboard paint lets kids take full control of the creative process without putting them in harms way. 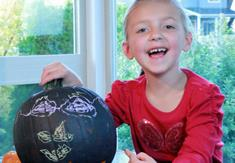 There are two keys to painting a pumpkin with chalkboard paint. First you want to make sure your pumpkin is clean, wash it off first and let it dry thoroughly. Second, the pumpkin must be room temperature, any condensation will cause the paint to slough off. Let the paint dry for 24 hours before applying chalk to the pumpkin. If you want to light up your neighborhood with your pumpkin, you need to put some holes in it. Cookie cutters let little ones get involved in pumpkin carving without picking up sharp objects. 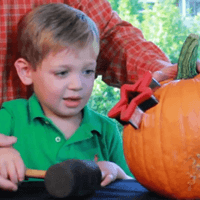 Have an adult help push the cookie cutter into the skin of the pumpkin, then supervise your child using a rubber mallet to bash out their favorite shapes from the pumpkin. Kids don’t get to have all the fun. Are you entertaining this Halloween? Nothing makes a Halloween party more festive than a pumpkin cooler. Power tools are the key creating a pumpkin cooler quickly. Use a jigsaw to make a level cut at the highest, widest section of the pumpkin. Next, insert a pumpkin gutter to your cordless drill and pull out the pumpkin guts. If your pumpkin cooler is going to be on display for a long time line it with a garbage bag or plastic bowl to prevent leaks from melting ice. All you need is some toilet paper and a small pumpkin to get the games going at your Halloween party. Look for the smallest, roundest pumpkin you can. Drill three half-inch holes into the pumpkin to make a triangle pattern. Finally, transform six rolls of toilet paper into ghosts by attaching a few dots of black construction paper and you are ready to roll.